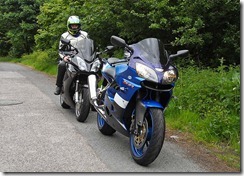 Cavturbo's Motorcycle Blog: Round Trip to Tywyn. 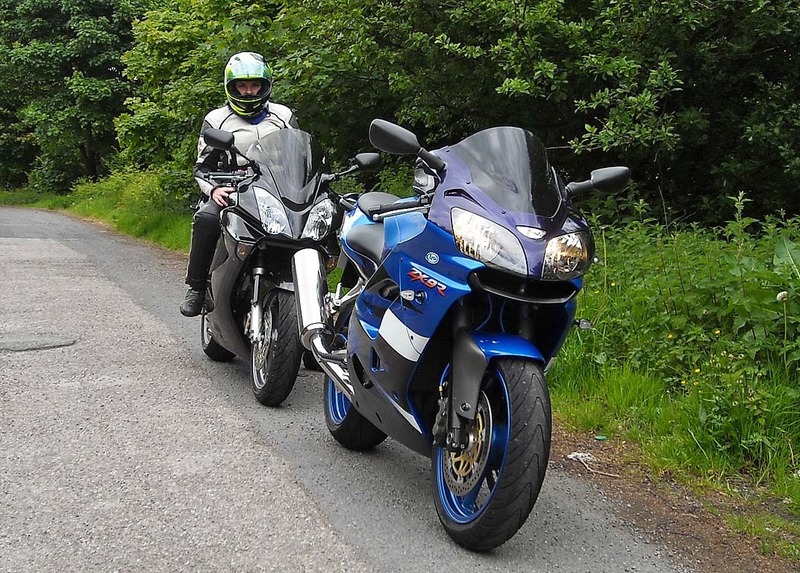 Helen and I went out on Bank Holiday Monday for a round trip of 285 miles to Tywyn in North Wales and back. We left home at around 10:00am and proceeded on the motorway network to junction 10 of the M56, where we joined the A49 towards Whitchurch. We followed the A49 past Tarporley and Beeston Castle, we then turned right onto the A534 to Wrexham. We continued on this road to Holt where we turned left onto the B5130 and followed that to the A528. After a short while we turned right onto the A539 towards Llangollen, where we cut across to join the A5. 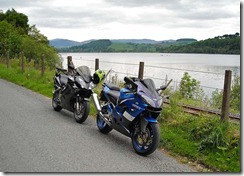 We followed the A5 through Corwen and then turned left onto the A494 to Bala. At Bala we stopped briefly for a comfort break before taking the A4212 to Trawsfynydd, past Llyn Celyn. We found our only police car of the day on this road, but had been warned of its presence long before we came across it. We turned left at Trawsfynydd onto the A470 to Dolgellau which was a very straight and boring road. Just before Dolgellau we turned right onto the A493 to Tywyn. This was a really nice scenic route following along the coast, we a few twists and turns. We stopped in Tywyn for some lunch and managed to park opposite a café. After a late lunch we left Tywyn on the A493 and continued along the coast on a scenic twisty route again. We took a slight diversion into Machynlleth for some fuel and then proceeded on the A487 towards Dolgellau. This is a very nice and twisty road and I highly recommend it but be warned you, will have to overtake a bit of traffic along the way. Just before getting to Dolgellau we cut across to the A494 via the B4416, which involved a nasty right hand (back on yourself) turn. We followed the A494 to Bala and turned off just before onto the B4403 and went through Llanuwchllyn. 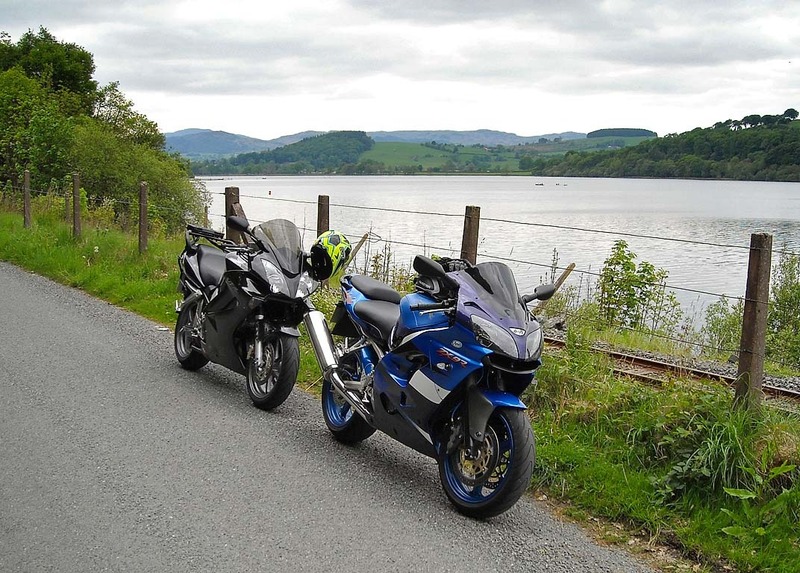 We followed the B4403 past the backside of Bala Lake before joining the B4391 and then the B4401 to Corwen. We then took the A494 to Ruthin and continued on this road heading for Queensferry. At Queensferry we joined the A5117 and followed this to the M56, where we met a bit of standing traffic and had to do some filtering. We stopped briefly at Costa Coffee at Chester Services, before rejoining the M56 and following it and then the M60/M62 home. We had a decent run today, but did come across a lot of traffic and a lot of stupid bad driving. It wasn’t bad enough to spoil the run in the end, it was good that Helen’s neck and wrists held up on such a long run. This was a good test for our imminent trip to the Pyrenees, as the distance we covered today was far greater than any 1 stint we will be doing on the upcoming trip.